Since 2001, Lin + Lam (Lana Lin and Lan Thao Lam) have produced multi-disciplinary research-based projects that address subjects such as immigration, sites of residual trauma, propaganda, democratization, militarism, national identity, and historical memory. Inspired by a particular site, historical incident, or political issue, their research takes the form of interviews, archival materials, site visits, and found objects. Their collaboration brings into conversation their divergent individual strengths. Lam's architectural training informs her work with materials, scale, and space, and Lin's experimental film background guides her attention to the formal capacities of moving image media. Emerging from the interrelation between current events and historical residues, their work offers a phenomenological context for understanding how the past impinges upon the present, and how the present shapes the ways we contend with the past. Their work takes place across a range of speeds, often requesting that viewers spend time with it and challenging them to be alert to things that might bypass them, from quotidian detritus to political regime change. Their recent collaborations have engaged social spaces where they put into question the politics of identity and cultural translation. These projects strive to speak alongside identities that travel across or between recognized categories. Lin + Lam approach their art practice as a means of negotiating difference, the difference in racial, gender, economic, and social status between themselves and a particular community and the differences inherent within the community itself. Involving themselves in an interrogative relation with their objects and areas of inquiry, they hope to foster productive interchanges between diverse and unlikely interlocutors. This may mean bringing together anachronistic sources, enacting counter-archival practices, or combining the personal with the political. The environments the artists construct or the events that they stage, whether physical or psychic, invite viewers and participants to contemplate the imbrication of history, power, desire, and memory. According to the Office of the High Commissioner for Human Rights, the term “stateless person” refers to one who is not considered as a national by any State under the operation of its law. The Webopedia Computer Dictionary defines “stateless” as “having no information about what occurred previously.” A stateless server, such as the World Wide Web, treats each request as an independent transaction without requiring any context or memory. This is Not Me points to negation—as it exists in ourselves and at the hands of the bureaucratic state apparatus. Such negation arises at the very moment of a double recognition—self-recognition and recognition of the erasure of other bodies in the socio-political landscape. 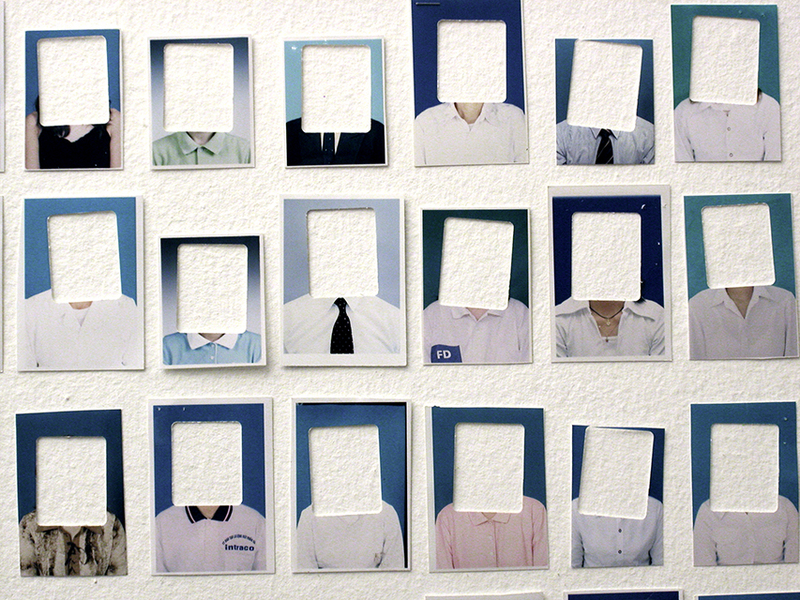 2005 Mixed media installation: 1,000 found photo fragments and archival plastic sleeves Variable dimensions. Courtesy of Lin + Lam (Lana Lin and H. Lan Thao Lam). 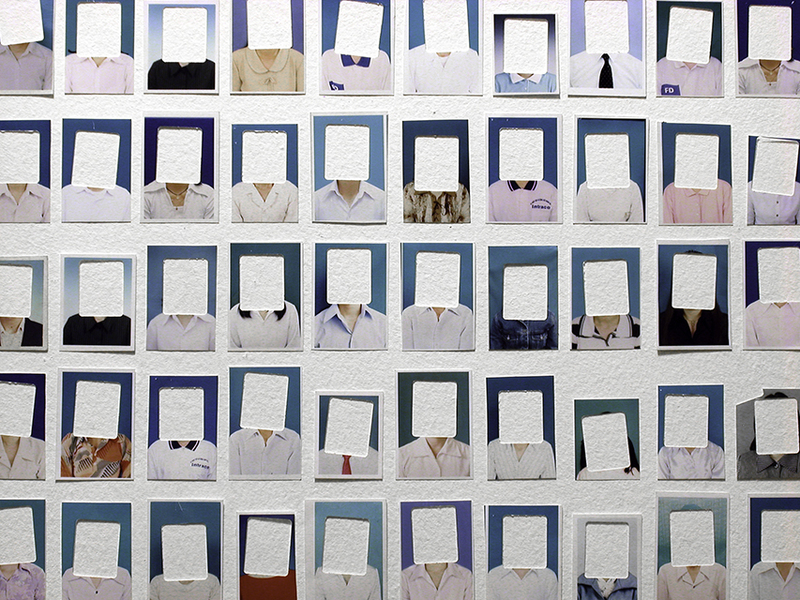 2005 Mixed media installation: 1,000 found photo fragments and archival plastic sleeves. Variable dimensions. Courtesy of Lin + Lam (Lana Lin and H. Lan Thao Lam). 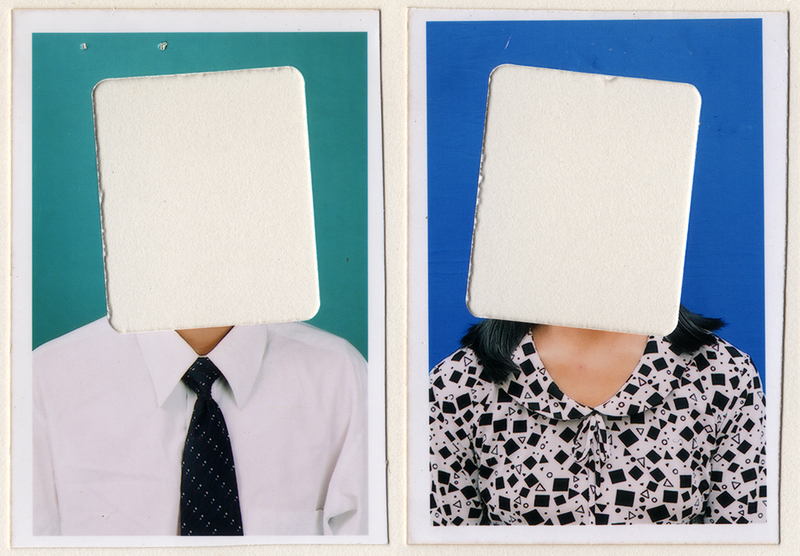 Mixed media installation: 1,000 found photo fragments and archival plastic sleeves.